As I prepare for my first ever solo Olympic-length triathlon, I’ve been reflecting a bunch on my first few races. I like to tell people I got conned into my first race–a friend talked me into joining her and then had to back out a few weeks before the race. But something stuck. 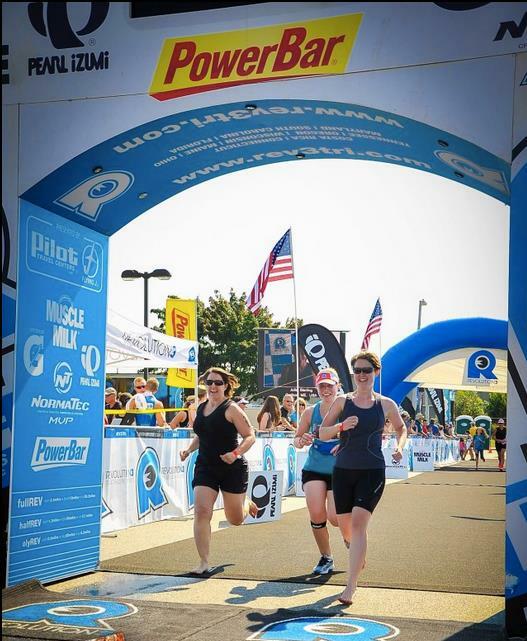 I don’t know if it was the sense of accomplishment at the end of each race, the diversity of training challenges each season presented, or loving the way the badass word triathlete rolled off my tongue, but five races later I’m still hooked. There’s a learning curve though–good lordy, this sport is complicated! There are any number of websites that can give you advice on training plans, gear, race strategy, transition techniques, and the list goes on. The sheer amount of helpful information can be exactly the opposite of helpful! Which is why I’m not exactly surprised when newbie triathletes reach out to me, though only three seasons in, I’m not exactly an expert. With that in mind, inspired by a recent email from a friend who’s signed up for her first not one but two triathlons this month, I’m returning to the advice column. The following is my best attempt to keep it simple for anyone looking to test the waters of the three headed sport I’ve come to love. 1. Invest in good basic equipment, but don’t go crazy on the gear. With three sports worth of marketing opportunities, triathletes get bombarded with gear suggestions. As with anything, though, you probably want to make really sure that you’re actually going to do it more than once before you blow a lot of cash on accessories and equipment. To help you wade through those decisions, I’ve got some recommendations below. There is, of course, a lot more gear you may find out there than is even on these two lists. And if you need compression socks, please buy them! 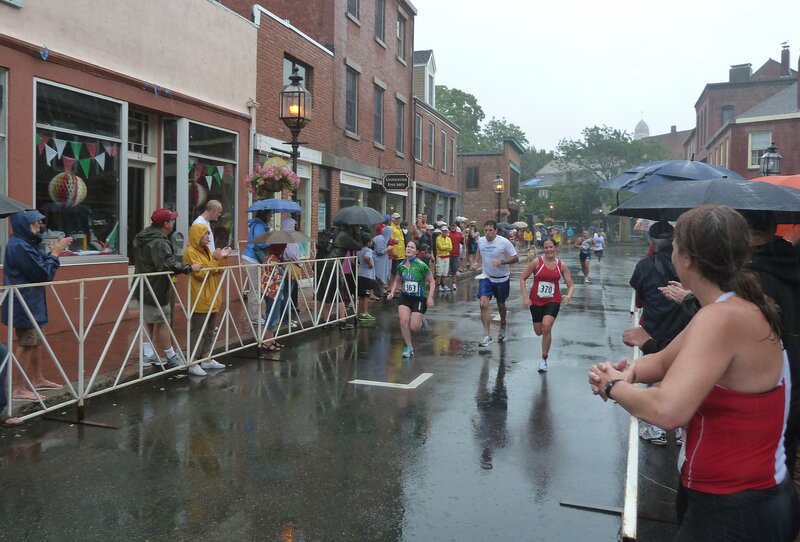 But don’t feel pressured to go beyond the basics on your first race. On top of all the other reasons not to break the bank, you will have about a quarter-towel’s-worth of space to lay it all out on race day! 2. Take your training seriously, but hold it lightly. I’m repeating myself here, but it’s worth reiterating and perhaps particularly with this type of undertaking. Triathlon training takes a lot of organization. You do, after all, need to find time for not one, but three sports each week. Prioritize the one you’re weakest in and if you have to skip a workout in the week, choose your strongest sport. (This makes sense, but is often hard to pull off, since the one you’re good at is likely the one you enjoy the most.) Take your workouts seriously–otherwise the race will be a rude awakening–but don’t skimp on the other things in your life that keep you healthy and happy either. 3. Plan your transitions, maybe even practice them, but don’t sweat them. Besides which, you’ll want someone to take awesome finish line photos for you that you won’t have to pay for! 4. Talk someone into coming to your race as a support person. Speaking of recruiting people, you probably want a sherpa! Did I mention how much gear this sport has? But besides helping to share the physical burden, it’s insanely helpful to have someone who can help you remember everything on race day, including warm clothes and comfy shoes for after the race. If you’re like all the rest of us, you won’t sleep much the night before the race and you’ll be up way earlier than you would deem sane. Your support person will help keep you grounded, cheer you on, and when your calf muscles are so shot you can’t even depress a gas pedal, they can drive you home. 5. Swim, bike, and run your own race. When your wave is given the signal to go, count to ten before getting in the water. Swim starts can be stressful and you’re not setting any time records today. Remember, you’re just finishing your first race–and if you set the bar low enough, your second race can be a personal best! Don’t try to prove anything to anyone else or beat the muscly dude who just took off from transition ten seconds ahead of you. If you beat people, that’s awesome, but be sure you remember why you’re there. Trust your training and then do what you’ve trained to do. 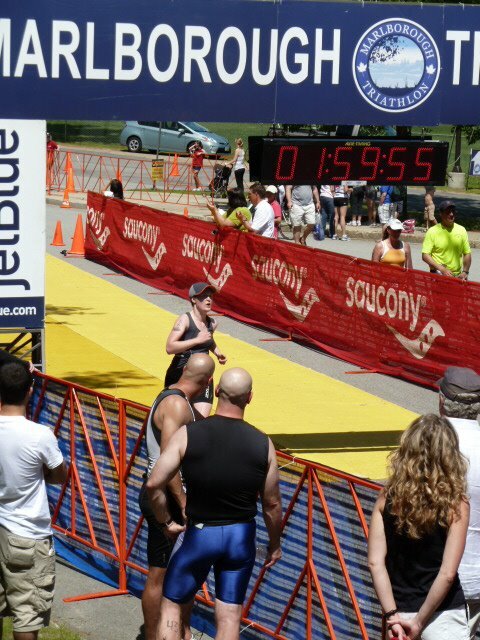 Group finish from the Olympic triathlon I did last summer as a part of a relay team–which is a great way to tackle a race that seems a bit daunting! 6. Remember reflect on all your body has done and take a moment to be grateful. Remember when you couldn’t make it up the stairs without huffing and puffing? Take a moment and let that realization sink in. You’ve come a long way. You’ve pushed hard and your body has responded. Recognize the work you’ve put in and the body that enabled you to do it. Find a way of briefly expressing whatever emotions that brings up for you, but be sure at least one of them is gratitude. Not every body is capable of what you’ve undertaken, not everyone will get to experience what you’ve just experienced. And that’s worth more than any medal or commemorative t-shirt. 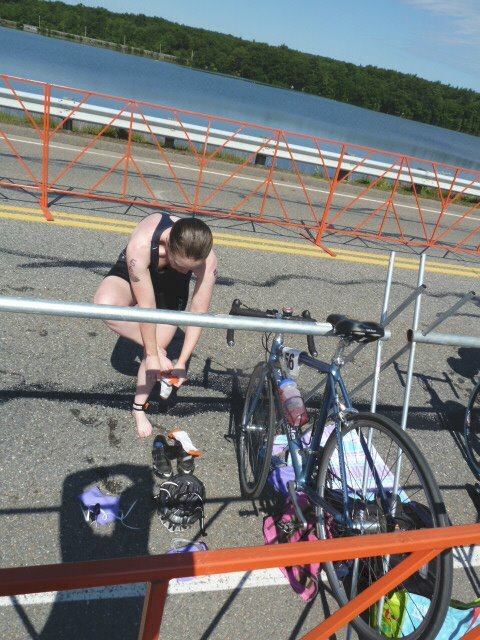 Congratulations, triathlete–you did it. Do you have another question or thing that’s stressing you out that I forgot to address? Leave me a question in the comments below! Posted on September 6, 2013 September 21, 2018 by egcharismollingPosted in The Advice ColumnTagged advice, cycling, Multi-Sports, Physical exercise, race training, running, swimming, Triathlon. Great post! Practical and simple.